Matt and opaque water-based acrylic colors, developed especially for brush-on use. Each color has been developed with the assistance of the Euromodelismo team of experts in order to offer the modeler a quick and practical system for painting the tank crews of World War II. The color range has been chosen to simplify the painting process and includes all the shades needed for the uniforms of the German, American, British, Italian, French, Russian and Japanese crews, using the popular figure painting technique of base color, shadow and highlights. It is recommended to apply the colors on a previously primed surface; they dry rapidly and form a homogenous and self-leveling surface while preserving even the smallest detail of the model. Panzer Aces performs extremely well on all supports and the adherence of the paint on resin, plastic, steel and white metal is extraordinary. Brushes and tools can be cleaned with water. Safety: Panzer Aces is not flammable, and does not contain solvents. Please see also certified safety information of the product on the Safety page. 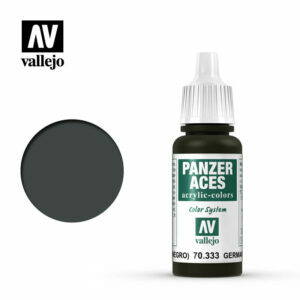 Packaging: Panzer Aces is presented in bottles of 17 ml./0.57 fl.oz. with eyedropper. This packaging prevents the paint from evaporating and drying in the container, so that It can be used in minimal quantities and preserved for a long time.